Internet Modeler Academy 1/35 Pz. Kpfw. V Panther Ausf G "Last Production"
The German military had a most disquieting encounter with something they apparently hadn't counted on, following their invasion of the Soviet Union in June 1941: the Russian Army's T-34/76 medium tank and the KV-1 heavy tank. The T-34/76 was a revolutionary design in terms of its sloped armor, while the KV-1 was a brute of a tank with very thick armor. Either way, the result was the same: Germany's existing tanks in the field had a very difficult time penetrating the T-34 and KV-1 armor. As reports flooded into the German Army High Command about unstoppable enemy tanks, some German military men thought that they might simply reverse engineer the T-34 from captured examples. However, they ultimately decided to create their own highly potent medium tank, which was named the Panther, the Panzerkampfwagen V. The Panther appeared in three main variants during the War: the Panther Ausf D, followed by the Panther Ausf A, and finally the Panther Ausf G. Each variant underwent improvements over its lifetime on the production lines. 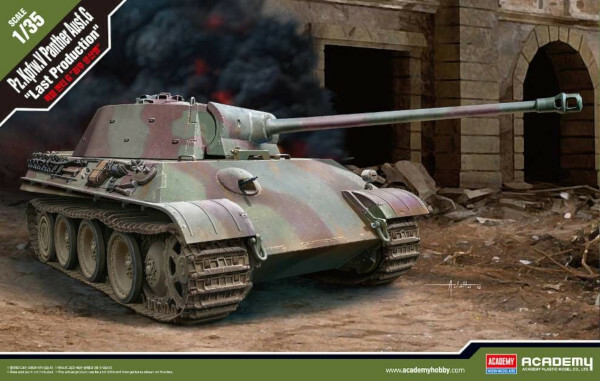 The Academy kit under review today is listed as the Panther Ausf G "Last Production" version. 2018 could very well have been named "The Year of the Panther Tank," as a plethora of new kits flooded onto the market in 1/35th scale, the hobby's most popular armor scale. Takom, Meng, Rye Field Models and Dragon all produced new tooled models Panther models, or re-released earlier kits with added parts. So, let's look at what Academy brought to the party. A two-part instruction manual: Part One has 7 pages of black and white assembly drawings covering 14 assembly steps. Part Two is a color layout, consisting of one additional page of assembly drawings, a page of sprue layout diagrams, together with a 6-page color and marking diagram. While the decal sheet only provides markings for 2 vehicles, there are painting instructions for SIX vehicles. The additional four are sans markings. The parts in this kit are very well molded, with excellent details. The parts count is relatively low compared to other new Panther kits, because Academy doesn't provide any interior parts other than a rudimentary turret main gun breach area. I noted no sink marks on any of the parts, and only one area of concern with regard to ejection pin marks: the tracks, which take the form of injection molded link-and-length parts. The individual track links have three ejection pin marks per part, while the lengths of track have between 6 and 16 pin marks depending on the length of the track part. 1) The idler wheel is the 600mm version introduced on the Panther Ausf D & A variants, as opposed to the 665mm version introduced by the firm M.A.N. in October 1944. However, the version utilized by Academy continued in production to the end of the War. 2) Academy's turret incorporates the ability to install the 5 welded rings on the turret side, as introduced by M.A.N. and M.N.H. in December 1944 to allow for the attachment of camouflage foliage (a feature not adopted by Daimler-Benz assembled Panthers). 3) The spare wheel mounting bracket introduced onto the rear side of the turret on Daimler-Benz Panther Ausf G's in December 1944 is not present in the Academy kit. 4) The "Wanne" ventilator, which is fitted forward of the driver/machine gunner hatches on the hull roof, dead center, had a bullet splash guard surrounding it. Originally welded outside the ventilator armored cap, it was readily visible. It was replaced by a circular one, installed within the footprint of the armored cover. The circular splash guard was fully introduced by December 1944. Academy appears to have both types installed at the same time. 5) The Warmluftbeheizung (warm air heater) was first introduced by manufacturer M.N.H. in September 1944, with the other Panther manufacturers following close behind. Academy's Panther ONLY includes the option of the Warmluftbeheizung installed. 6) Main gun mantlet: two options are included in Academy's kit, the standard rounded example, which proved to have a shot trap issue, and the later mantlet designed to stop this effect. 7) Rear hull exhausts. Academy only provides for one type in their instructions, the exhausts with flame dampers for night operations, though there are additional parts on the sprues not mentioned, for different armored exhaust mounts. 8) Late War steel rimmed road wheels are provided for the last station on each side of the chassis. 9) The tracks, as noted earlier, have numerous ejection pin marks per part, and they also lack the correct hollow guide horns. I have built a number of Academy's recently released armor kits, and I experienced zero issues with parts assembly. I am presuming that this Panther kit will have an equally good parts fit. The relatively small number of individual parts will be a big bonus to many modelers, especially those with Beginner or Average skill level. The price of Academy's kit is very competitive. The price is substantially below Dragon Model's latest pricing levels, and also cheaper than kits produced by Meng, Takom and Rye Field Models. The only issue I can see is with the tracks. They are perfectly serviceable if you aren't too fussy about the pin marks (most will be hidden, or can be hidden with a little "mud"), or the lack of hollow guide horns. Many modelers chose to replace kit tracks with suitable aftermarket sets anyway, in which case the Academy track issue is moot. I would like to thank Model Rectifier Corporation, Academy Model's USA importer, for the opportunity to review this excellent model kit. I believe that modelers of all skill levels will be able to produce a lovely model of this important tank from Academy's kit.